Guillermo was born into a family in Argentina which owned department stores. First he studied economics and law, becoming a lawyer and Doctor in Economics. After 18 months in Europe, building up his skills in English and French languages, he returned to Buenos Aires and worked in the family business for 12 years. He was then a Director of the Stock Exchange of Buenos Aires, a private bank and other companies. He is now retired. 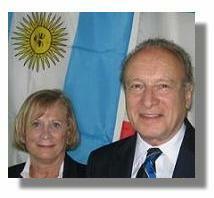 At the age of 28, Guillermo joined the Rotary Club of Buenos Aires, holding nearly all positions. He led a Group Study Exchange team to England in 1977 and has held various district appointments. He was approached in 2000 by IC Joe Philips about forming an IYFR Fleet in Argentina. This was chartered during the subsequent convention in Buenos Aires taking the name Rio de la Plata Fleet. He was its first FC. He chartered a second Fleet also in Argentina in 2004 and in 2009 in Brazil’s most populous city Sao Paulo. This was followed by Punta del Este, in Uruguay, Guayaquil, in Ecuador, Puerto Varas in Chile, after that, two more fleets in Peru and one in Colombia. Guillermo is married to Monica Renaud and they have four children and three grandchildren. Apart from sailing he has a special interest in English and French literature. Bob is a retired Clinical Biochemist, who worked most of life in hospitals in the West of Scotland. He started sailing in 1981, when he moved to a hospital on the River Clyde. He joined Rotary in 1985 and, after holding a number of offices, became President of the Rotary Club of Greenock in 1998/99. He joined IYFR in 1994 and quickly went on to become Commodore of the Clyde Fleet in 1996/98. He subsequently took on the role of Regional Commodore for Great Britain and Ireland in 2010/12 and that of Area 1 Commodore in 2013/15. Ann has always been at Bob’s side supporting him throughout his time in IYFR. The two of them have cruised extensively together around the West of Scotland and the North East of Ireland, becoming familiar with many of the islands and anchorages which are found dotted around the coastline. They prefer the leisurely life of cruising to the cut and thrust of racing and organized the Post Convention Cruise in 2009. Ann is also now a member of Rotary and Commodore of the IYFR Clyde Fleet . David was born the son of a farmer and left home at a relatively early age, first to go to College and then for work and university studies. Being intensely practical he started in a trade before working and then going to university, graduating as a Mechanical Engineer. He then joined the largest Consulting Engineering practice in New Zealand and worked in the field of building services and later project management. Along the way he spent 9 years living and working in South East Asia before returning to the Auckland office as a Director of the Company. In 1991 he joined Auckland International Airport, first as head of Engineering and later as General Manager of Operations, responsible for the day to day operation of New Zealand’s busiest and largest airport, before retiring in 2007. In 1991 he also joined the Rotary Club of Northcote and has served in many roles including President. He has also held a number of District positions, the most recent being Assistant Governor. He is also currently involved in Rotary building projects in Vanuatu. In 2007 he joined IYFR as a member of the Auckland Fleet, serving as PIC Terry Stretton’s Chief of Staff from 2009 to 2011, then as Commodore of the Auckland Fleet from 2013 to 2015 and more recently as Regional Commodore South Pacific and Special Advisor to the International Bridge. Currently David has a 7 metre power boat which is used in Auckland and down the east coast at Waihi Beach. He has two daughters and three grandsons.